Its brightest stars are Rigel (Beta Orionis) and Betelgeuse (Alpha Orionis), a blue-white and a red supergiant. Many of the other brighter stars in the constellation are hot, blue supergiant stars. The three stars in the middle of the constellation form a unique asterism known as Orion’s belt. The Orion Nebula is located south of Orion’s belt. 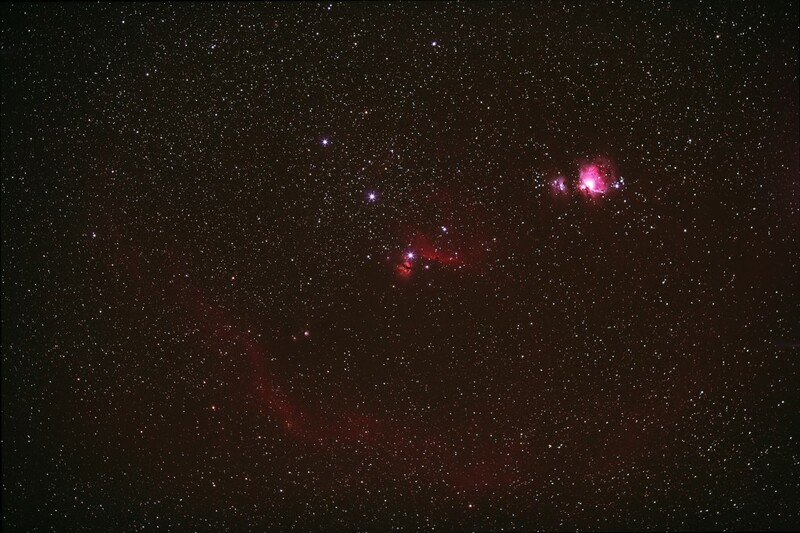 In this photo the three main belt stars, the horsehead, and great Orion Nebula are visible. This is a composite photo made from 4 – 5 minute exposures at 800 ISO with a Canon 5D attached to a 600mm telescope. This photo was taken by Jerry Hilburn in 2008.